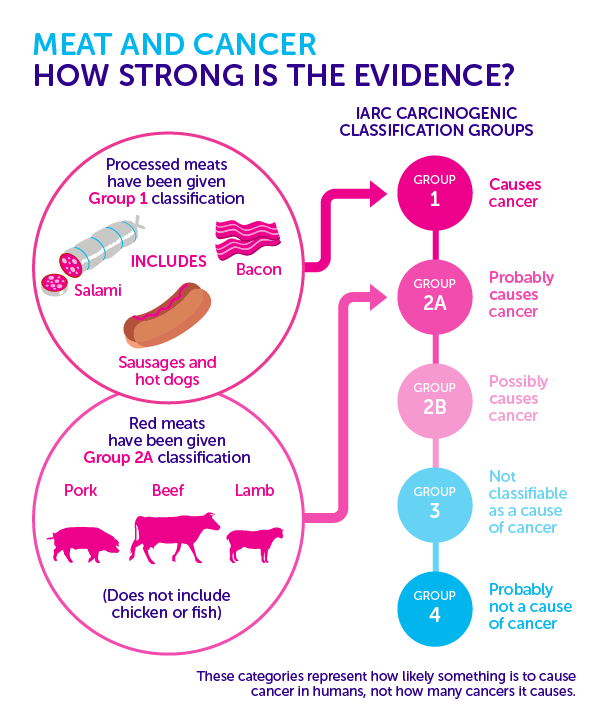 You’ve probably seen today’s headlines, about the fact that processed meat has been classified as a ‘definite’ cause of cancer. And red meat is a ‘probable’ cause. 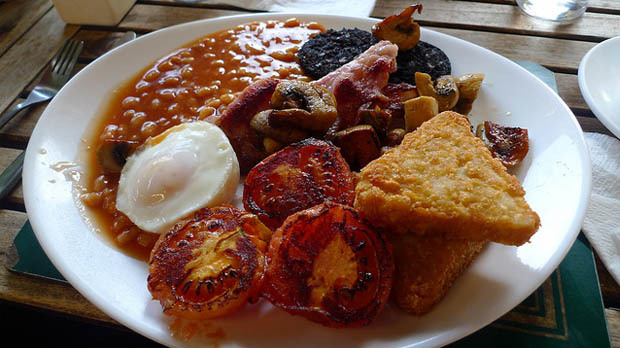 There’s now a large body of evidence that bowel cancer is more common among people who eat the most red and processed meat. 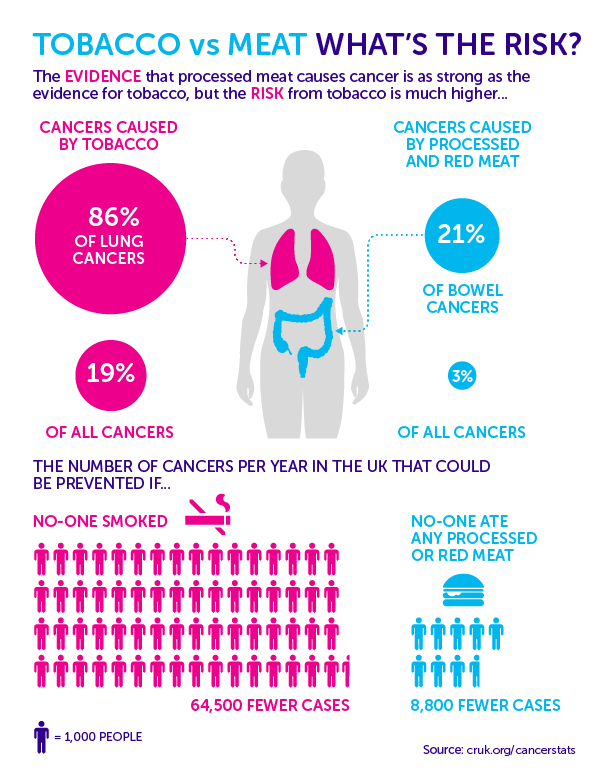 As this evidence has steadily built up, we’ve blogged about itseveral times – and it’s covered on the NHS Choices website and by the World Cancer Research Fund (WCRF). 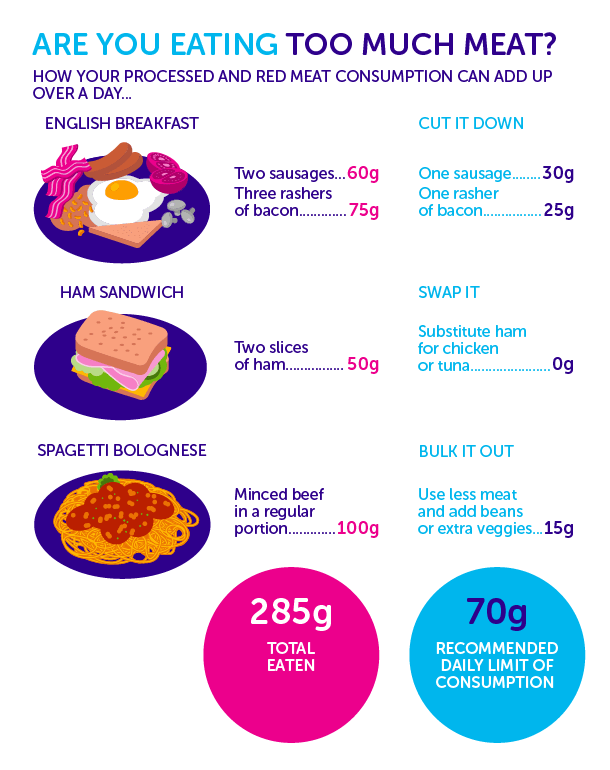 The results showed that those who ate the most processed meat had around a 17 per cent higherrisk of developing bowel cancer, compared to those who ate the least. IARC does ‘hazard identification’, not ‘risk assessment’. That sounds quite technical, but what it means is that IARC isn’t in the business of telling us how potent something is in causing cancer – only whether it does so or not. To take an analogy, think of banana skins. They definitely can cause accidents – but in practice this doesn’t happen very often (unless you work in a banana factory). And the sort of harm you can come to from slipping on a banana skin isn’t generally as severe as, say, being in a car accident. DONT FORGET – Help us do science! The survey should only take 5-10 minutes to complete. You can find the survey here: http://bit.ly/mysciblogreaders. By participating, you’ll be helping me improve CauseScience and contributing to SCIENCE on blog readership. You will also get FREE science art from Paige’s Photography for participating, as well as a chance to win a t-shirt or a $50.00 Amazon gift card (100 available). In case you didn’t see the media coverage of an abstract from the recent meeting of the American Society of Human Genetics in Baltimore, Maryland (see Nature News stories here), an abstract presented preliminary data in the search for the genetic roots of homosexuality in human twins. Obviously this scientific presentation, and the press release about it from the conference, generated excitement, skepticism, and now controversy. Nature has a terrific editorial this week examining how this was a failure in science communication. Scientific conferences and meetings are meant to be a place to present preliminary, controversial, and incomplete studies to scientific peers to get feedback, ideas, and promote the work being done. Criticism of the work and experiments are always a part of this process, but where do we draw the line? A few critics went so far as to argue that the authors should not have presented such preliminary work at the meeting. And at least one suggested that the authors could have provided preprints of their study when presenting it. These arguments seem to misunderstand the traditional, and still useful and relevant, role of such gatherings. Studies with small sample sizes and controversial methods are presented at conferences all the time, and many scientists already fear being scooped when they present even a bit of their data. One might wonder how so much media coverage was generated from a scientific conference abstract, and the answer is that the conference used the abstract in a press release, unfortunately titled, ‘Epigenetic Algorithm Accurately Predicts Male Sexual Orientation.’ While this may represent the science, it opens the door for misinterpretation by non-scientists that never saw the data presented. This failure in science communication has a remedy, and it involves being careful with press releases of unpublished, non-peer-reviewed science, especially on topics that could be ‘misused’ or misinterpreted by the press. The genetics of homosexuality is a subject that will always find media coverage, partly because of the societal interest in the topic. Neither the scientists nor the conference organizers can be held responsible for how some in the media chose to write about the study. But both could have done more to get the right message across.